Starting Feb 15, 2017, the pre-sales forum will be replaced with a link to the Sales Contact form on the website. Topics posted here prior to that date that are not pre-sales related by registered product owners will be moved to the appropriate sub-forum. 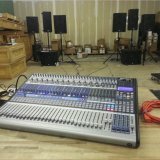 For pre-sales and product information inquiries, the sales team can be contacted directly by visiting the PreSonus Contact page at the link below and select Sales Department in the drop down selection. For customers that already own products please start topics in the appropriate sub-forums under the appropriate product categories.